Bill Gates says he in investing in Generation IV nuclear power plants through Terra Power, which he says would be safer and more efficient than modern nuclear reactors. The first of such plants could come online in 2022 he tells Wall Street Journal's Alan Murray at the 2012 ''ECO:nomics conference''. TerraPower is a nuclear reactor design spin-off company of Intellectual Ventures that is headquartered in Bellevue, Washington in theUnited States. TerraPower is investigating a class of nuclear fast reactors called the traveling wave reactor (TWR). One of TerraPower's primary investors is Bill Gates. In December 2011 India's Reliance Industries bought a minority stake through one of its subsidiaries. Reliance Industries Chairman Mukesh Ambani will join the company's board.Where as standard light water reactors such as PWRs or BWRs running worldwide use enriched uranium as fuel and need fuel reloads every few years, TWRs, once started, use depleted uranium instead and are considered to be able to operate for between 40 to 60 years without fuel reloading. TerraPower has chosen TWRs as a technology for further development. 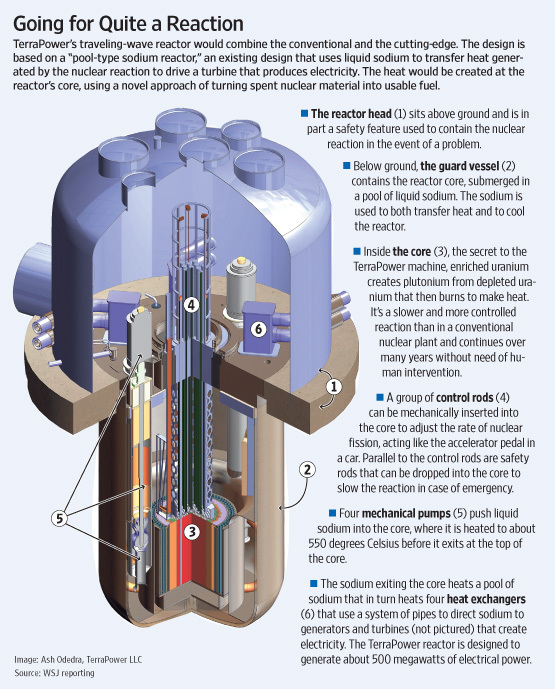 The major benefits of these reactors are that they can get high fuel utilization (enhancing sustainability) in a manner that does not require reprocessing and could eventually eliminate the need to enrich uranium TWRs are designed to convert typically unusable fertile nuclides such as U-238 into fissile nuclides like Pu-239 in-situ and then shift the power from the highly-burned region to the freshly bred region. This allows the benefits of a closed fuel cycle without the expensive and proliferation-sensitive enrichment and reprocessing plants typically required to get them. All the fuel required for between 40 to 60 years of operation could be in the reactor from the beginning. TerraPower plans to have a TWR prototype built by 2020 producing electricity for the grid in the several-hundred megawatt capacity range. The man really knows his nuclear!! That's for sure! As the population increases and our country becomes more industrialized, the idea of using nuclear energy for power generation is certainly the right one. The truth is, Malaysia cannot continue to depend heavily on fossil fuels (natural gas & coal) for power production. These fossil fuels will deplete eventually. In fact, many other developed countries have opted for nuclear power due to its efficiency & environmentally friendly effect. Therefore, what's stopping us to "go green, go nuclear"? 1. One nuclear fuel pellet (the size of a pencil's eraser) produces about the same amount of energy as burning 1 ton of coal, 150 gallons of oil or 17,000 cubic feet of natural gas. 2. Less radiation is produced by a nuclear power plant than a coal-burning plant. 3. Nuclear power plants emit no carbon dioxide (which contributes to global warming and the greenhouse effect) nor sulfur and nitrogen oxides (which cause acid rain). 4. Nuclear energy accounted for 77% of France's electricity, 52% of Sweden's, and 22% of the United States'. In your opinion, should nuclear power plant be imposed in Malaysia? Does the World Need Nuclear Energy? Letter to New York Times commenting on article entitled "Blamed for Wildfires, PG&E Seeks Higher Electricity Rates." MEHB513, Sem3 2011/2012. Watermark theme. Powered by Blogger.